Happy Saturday to you! 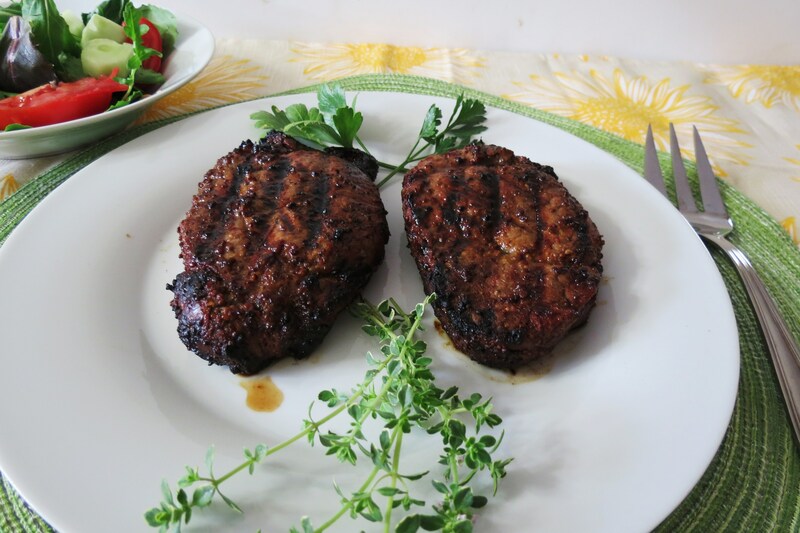 For the Father’s Day weekend, I thought I would post one of my Husband’s favorite dishes which is Grilled Filet Mignon. 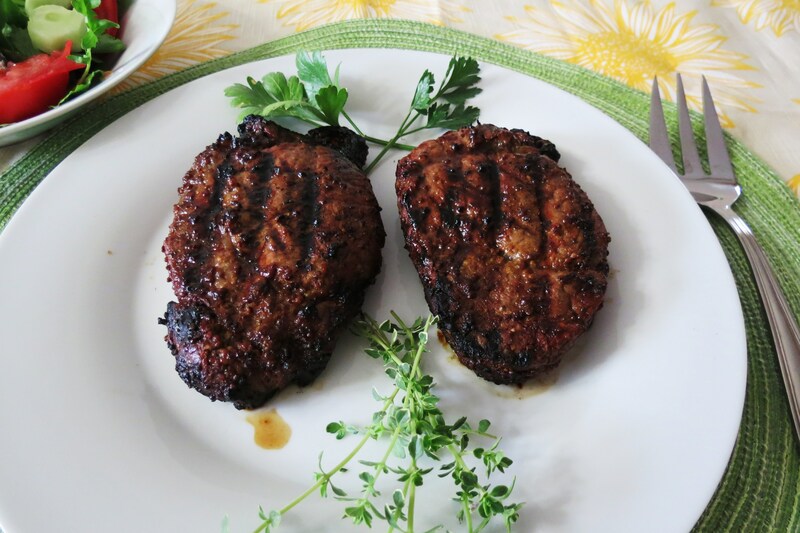 This Filet Mignon is so tender and juicy and cooked to perfection. Yum! 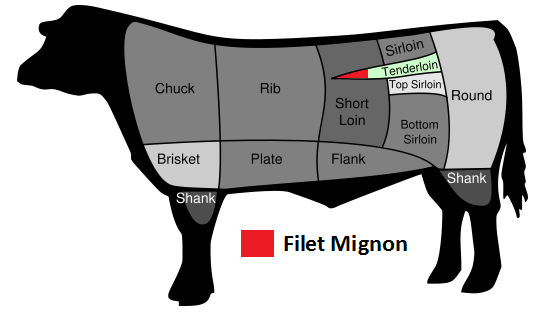 Here’s a little scoop about the Filet Mignon that I just love! It’s one of the lowest fat cuts of beef, yet it is the most tender steak, it just melts in your mouth. It’s also one of the lowest calorie steaks you can get! It has about 196 calories per 4 oz and 10.5 grams of fat, not to shabby for a tender cut of beef. The worse steak you could order a Ribeye which has 310 calories for 3 oz and 27 grams of fat! ECK!!! The Filet Mignon besides being a good source of protein, it’s also a good source of vitamin B6 and B12 which helps reduce the risk of heart attacks and colon cancer. So there is no reason not to have a nice filet every once in a while. But as an FYI the lowest cut of beef you can get is Top Sirloin which comes in at about 156 calories per 4 oz. and 5 grams of fat. Not bad! I normally don’t buy steak too much, I like to buy it for special occasions or if I want something from my Husband, just kidding about that! How do you think I got my Coach Purse? No, really I’m only kidding. I feel if I were to make it all of the time it would not be appreciated. So when I do, it’s a treat! Kind of like when you make a cake! Yes we could eat cake everyday, but isn’t it much better, when it’s only every once in a awhile? Than you see the smiles and people feel like you did something special for them. That’s how I feel about steak! For my filet, I marinated it for about 4 hours in a little olive oil, soy sauce, Worcestershire sauce, garlic, lemon juice and spices. I placed these tender bad boys on the grill over medium heat for about 7 minutes per side for a well done steak. I’ll be honest with you, I am not the best cook when it comes to knowing when your steak is done. I’ve done the tenderness test by feeling the palm of my hand and then the steak. I can’t tell the difference, I don’t know how people can? I just make sure I don’t burn it! 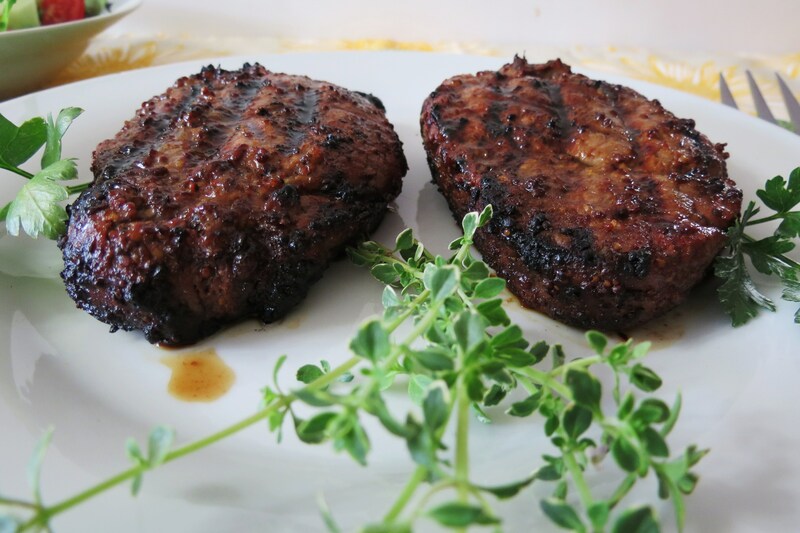 A juicy, tender filet mignon marinated in olive oil, soy sauce and other special seasonings and grilled to perfection. In a bowl add olive oil, soy sauce, Worcestershire sauce, mustard, garlic, lemon juice and black pepper. Mix until combined. 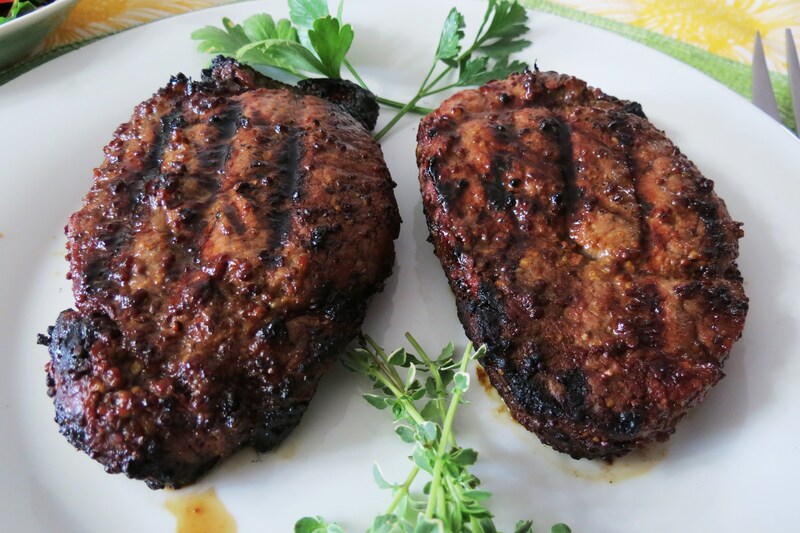 Pour marinade over steak and put in the refrigerator and marinate for 1 hour up to 8 hours. Place on a grill on medium heat, and cook for 7 minutes per side or until meat is fully cooked. It’s Friday night, so it’s time to clean up the kitchen and prep it for the weekend. I’m hoping to get some baking in, but it’s suppose to be HOT, in the 100’s here, so I’m not sure how much I’ll be able to do, so be prepared for cool dishes and light meals this week. I hope you have a wonderful weekend! Now get out there and enjoy the outdoors, hit up your Farmers Market, go for a stroll through the neighborhood and make a nice cool spring treat!!! Nice recipe. Going to have to try it. Amazing photos btw. I kid you not, I had that cow picture on one of my Food Selection & Preparation exams haha. 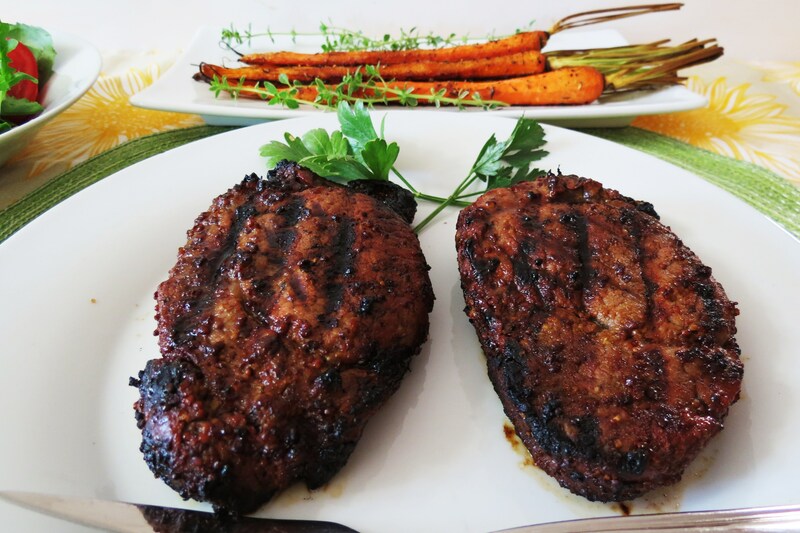 This looks really good – I have been enjoying a little red meat lately! I’m really trying hard to keep my computer from getting drooled on, but it’s not easy! This looks fantastic! lol, you make me laugh!! Have a safe flight home and welcome back to the States! These look great, sliced up on top of a big salad is what I am dreaming about now!!! Ohhh, the steak would be good on a salad!! Great idea! Invest in a meat thermometer, cook unril the internal temperature reaches 125 for medium-rare or 130 for meduim and let the steaks rest for 5 minutes before serving. eye no hau 2 spel. Great idea! Thank you!! I always have the worse time telling when it’s done!! Thank you so much!